I visited my dad not too long ago. It was the beginning of November and fall was starting to take it’s grip on the country. For the dynamic father and son duo, this meant the revival of a proud family tradition: slow food! When the days grow shorter, darker and colder, we’ll sometimes take the time to bunker up in the kitchen with a tough piece of meat, some winter vegetables, herbs, spices and other flavorings, and a bottle or two of beer and/or wine. We’ll spend whatever time needed, having a few laughs, talks about life in general and one or two sips of quality brew or wine while working together to transform our ingredients into proper man food, rich; decadent oft-time original dishes bursting with flavor. Alcohol, in moderation, is usually a part of the father/son cooking ritual. I love cooking with spirits! These sort of ordeals usually start out with neither of us really having the faintest idea about what to cook, then heading out together in search of a main protein. As a protein is eventually settled upon, complimenting or contrasting ingredients are quickly picked from a very scientific “this should work well, quite possibly, maybe” approach and added to the basket. When the basket is full, or we feel we have what we need and then some, we return home, pop open a cold one and set to work. Heading off in one direction, changing course a few times along the road, adding stuff that wasn’t meant to be added and eventually winding up in a place entirely different from what we’d planned but usually all the more interesting. This November’s Father and Son Cook-a-thon was not very different, only this time it included an often overlooked, often frowned upon hunk of meat, cut straight from the head of an animal: pork cheeks, with bacon, braised in porter and other dark and fragrant things. “Why don’t you just make hog hearts in cream sauce?” Came the reply from my half-sister, Mie, who we’d enlisted as our driver for the afternoon. “Why thank you for the suggestion,” I said, “but we already settled on pork cheeks!” Little did I know in the moment that she was actually being sarcastic. Little did I know that she truly and honestly found my dinner choice revolting because the cheeks were sort of scary looking, came from the head, needed thought and work, and certainly weren’t one of the well-known, pretty, quick and easy cuts of pork. Pork cheeks in the buff.. Alright, they’re maybe not that appetizing, I’ll give you that. Seeing this sort of reaction to a wonderful piece of meat made me realize that I grew up as part of a spoiled generation. One in which getting what you wanted has become common even when it comes to meat. After all is said and done, a shocking amount of us eat ten cuts of meat or less as part of our daily consumption: Chicken breast, pork loin (whether roast or chops), tenderloin, beef roast or steaks, and the world’s favorite cut of meat: the mysterious and oft-time unplaceable ground beef. But there is a hell of a lot more good eats to be had on an animal that has already been cut down for the sake of its prime cuts. Sadly, though, we tend to forget or deny. Pork cheeks, and other oddly placed tougher cuts of meat in general, are largely and completely misunderstood as inferior cuts of meat. Mainly because they oft-times look a little odd, are placed in so-called unappetising places or because they actually require a fair bit of thought, planning and time to prepare. I am, however, willing to state my reputation that tough cuts, when handled and cooked properly, are almost always more flavorful than the firm, lean and tender cuts that we’ve grown to know and love. And I’ve got culinary science on my side to prove it! Why, then, Mr. Food Science are tougher cuts more tasty? Well, the lean, tender cuts are lean for a reason. They’re harvested from body parts of the animal that do very little work. Take the prime example, tenderloin: a large, narrow muscle which does very little but just hang around stretching from one end of the animal to the other. This leads to a cut of meat with a firm, lean and tender musculature which excels in texture, overcooks extremely easily and packs very little flavor as we’ve not much but a bunch of muscle fibers to lend flavor to the party. And then there’s the other red meat, usually cuts harvested from the extremities of the animals including the legs, neck, head, tail or belly. They do a hell of a lot more work and as such are full of inter-muscular fat and connective tissue , and pack a much denser, tougher texture. In other words, they contain a lot more flavor and potential and certainly don’t overcook as easily. Actually, they may take from several hours to half a day to cook to tender perfection and the flavors of which I speak may themselves take hours of cooking to fully develop. As such, cooking tougher, less premium cuts of meat must be seen as an investment of time and effort, which probably goes to explain why so many people hate on the lesser cuts of meat. They either haven’t the time, the patience or the know-how and end up with tough, not fully flavorful and disappointing end results. And you can’t really blame people for hating on tough tasteless meat, right? Trust me, though, with a little investment of time and understanding, cooking tough cuts is actually a hell of a lot easier than cooking tender cuts. And believe me, your investment, if done right, will be handsomely rewarded. All this talk of science may, despite my best reassurances, lead you to believe that there’s ample science and thought behind cooking tough cuts of meat. And, well, there is but the good news is that you don’t so much need to learn and understand the science as you need to just understand and follow a few very simple rules. If you do, you’ll never have tough and chewy slow food again. Promise. Secret tip for unappetizing cuts #1: Start with bacon! 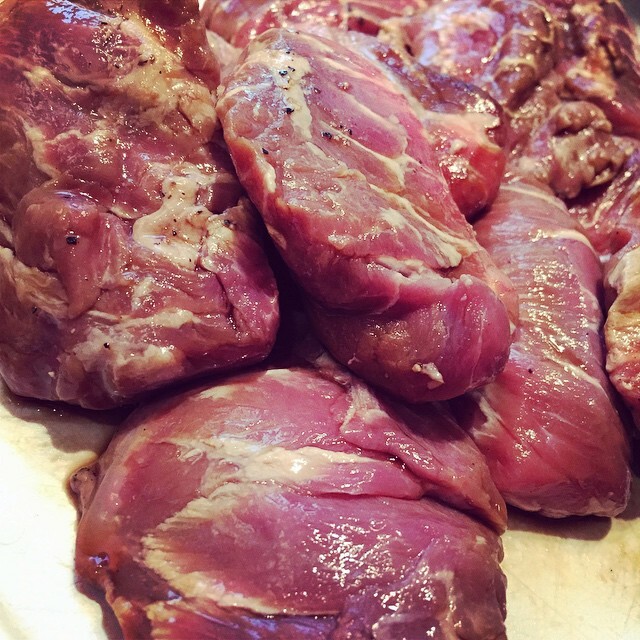 I’m using pork cheeks as the subject of this post, but these general rules and methods will pretty much work with any irregular, slightly odd, fatty cut with a bit of connective tissue in it. Regardless of size, variety and even critter. Rule #1 – A fatty pig is a happy pig! The first thing we need to understand about slow food is that fat isn’t evil. And neither is connective tissue. In fact, we need a bit of both to produce really succulent and flavorful slow food dishes. See, as our tough and fatty meat cooks low and slow for an extended period of time, two things will start to happen: the fat will slowly render out, basting the meat inside and out as it cooks. While this happens, the connective tissue, made of a substance called collagen, will slowly start to dissolve into a more well-known substance called gelatine which will further lubricate the meat, adding flavor and succulence. It’s a combination of these two processes that gives slow food classics, such as the barbecue favorite pulled pork, their finger-licking goodness. And who the hell doesn’t like good barbecue? So, rule number one, fat is good, okay? For the culinary magic to take place, we need some fat. Actually, we need quite a lot of fat. Stop fussing, fat isn’t evil and most of it cooks away anyway, or can be very easily removed after cooking. So, we need some chunks of nice, fat, happy pork, huh? Well, that’s actually not quite as easy as it sounds these days. The current demand for firm, lean cuts of meat along with a general perception that meat should be readily available at extremely low prices has led to some pretty horrible things happening in modern pork production. As we demand lean pretty cuts, today’s pigs are a lot leaner than those of generations past and they’re generally raised under some pretty horrific conditions in tiny quarters, using hormones to help them grow quickly while preemptive shots of antibiotics, penicillin and other fun stuff are administered to keep the poor animals from getting sick from the horrible treatment. This process obviously produces a lot of pigs very quickly. Pigs that are lean, tasteless and dangerously full of hormones, poisons and penicillin – not to mention residual fear and pain. So once again I beg of you and your conscience to consider for a minute organic, free-range meat production. It’s more expensive, sure, but your investment will be many times returned. Remember, your food is only as good as the ingredients you use. Free-range, organic pigs, for instance, are raised under strict regulations as regards space to move around, time to grow, fodder, (lack of) administration of growth hormones, penicillin and more. For only a small extra premium you get meat from pigs that have had time and space to grow, have been well and properly fed and have had the time to run around, play and develop a decent amount of fat and connective tissue. In other words, you get a product that not only tastes of something but is actually also relatively good for you as it has not been fed hormones or proactively treated with antibiotics and penicillin. How’s that? You not only get meat that tastes better, you also get a clean conscience and run a slimmer chance of becoming what you eat: a sick, antibiotic-resistant and eventually deceased pig. Yes, people in this country have died from eating pigs from conventional meat production. If that’s not a wakeup call, I don’t know what is. And if escaping that fate is not worth an extra buck or two, I don’t know what is! Procuring free-range meat: Procuring quality meat can be a bit of a challenge. Clever marketing people have deducted that people like looking at happy creatures so even the worst treated animals may come in packages sporting pictures of happy animals. So the best advice is: Don’t look at the happy pictures, look for something that’s actually clearly marked with the magic words organic and/or free range. They may not be too easy to come by, but give it a shot. Some more popular cuts should be available at your local supermarket, but for more sophisticated ones you may have to turn to your local butcher. He, on the other hand, should have a clear-cut opinion about the source and treatment of his cuts. If not, find another butcher. Plain and simple. Rule #3 – Looks are only skin deep, do not worry about appearances! If we can accept that to cook good slow food, we’ll need a fatty cut of meat and that said meat comes at a certain price, we can probably also accept that flavor is the most important part of the equation, not appearance. A fatty cut of meat will never be as attractive as a lean, center cut piece of tenderloin so stop expecting it to be and stop searching the meat section for that perfectly attractive chunk of meat. Grab something that has a reasonable fat to meat ratio and is quite heavy. Take it home, cook it forever, THEN worry about trimming off excessive fat, connective tissue. and cartelage. It all adds flavor during cooking and chances are whatever you’ve come up with will be either shredded, chopped, glazed or heavily sauced, anyway. I say no worries about appearance until plating time arrives. Speaking of appearance, some people have a hard time with cuts coming from, uh, alternative parts of the animal. In this case, my half-sister’s reaction to a cut from the head would be a great example. And it’s a shame because they’re missing out on some really great, fall-apart tender and flavorful cuts simply because their position on the animal make them somehow unappealing and disgusting. There are so many greatly overlooked cuts on animals that go to waste simply because of their name or where they’re placed. If we’re going to slaughter an animal for our enjoyment, we at least owe it to consume it fully or best as we can. Anything else is not only glutenous, it’s also wrong. So please, do as I do sometimes, try one of those strange, freaky cuts every now and then. Close your eyes, dress it up, lie to your guests if you must, and just try it. You may be in for a surprise! Rule #4 – Cook low, and cook slow! Alright, enough with the pleading and moral lessons. You’ve got yourself a nicely sourced, hopefully organic and well-treated, possibly unattractive fatty cut of meat with some connective tissue to spare, hopefully sourced from an unfamiliar place on the critter. Now, how do you make it edible? Well, there are a lot of tips and tricks, some of which we will touch upon shortly, but the one basic rule that you must understand when it comes to making tough cuts of meat tender and palatable is this: Cook it low and cook it slow! The process of rendering fat and turning collagen into gelatine starts at around 70C and takes time. So expect to spend at least a few hours on the project. Hey, there’s a reason they call it slow food, you know? What I suggest when planning any sort of slow food adventure is to allow for at least a few hours of cooking time at 100 – 140 C (and upwards of a day if cooking something large and ambitious such as pork shoulder roast). So plan ahead, create a good playlist, get some reading material or a movie, invite some friends over if you feel like it, pop open a beer or open a bottle of wine, relax, enjoy and let great spirit and wonderful smells fill the house. Rule #5 – Add a bit of moisture! Tough cuts of meat like low and slow heat. They also like the heat to be evenly distributed and not dry. So this particular job is not one for your frying pan. Nor is it one for the oven. Well, not the oven alone anyway. When cooking tough cuts of meat, you’ll want to ideally create an enclosed cooking environment where the heat is evenly distributed and the meat is moist but not covered in liquid. In culinary terms, we call this a braise – a situation in which a product is cooked in a tightly sealed environment with enough liquid to keep everything moist, but not so much that the meat is submerged and boiling. The easiest way to create such an environment is to grab a sauté pan with a tight fitting lid or a cast iron pot or Dutch oven with an equally tight fitting lid. Into the pan set on low heat goes the meat and/or other ingredients along with a bit of liquid – could be water, could be stock, could be beer or wine or any combination thereof – and the entire thing is then simmered for hours either on the stove top or in a low oven. That really is the gist of it. All you need is heat, moisture, flavorings and time. There’s a little more to it, of course, but the basic process is dead simple and dang near impossible to screw up. Worried about over-cooking? Don’t panic! We all know how easily we can overcook those expensive, lean cuts of meat and how disappointing the results are. Well, wanna hear the best thing about cheap cuts of meat? They’re practically impossible to overcook! Well, let me rephrase that: they’re not impossible to overcook, they’re desirable to overcook. Because it’s really at the point of overcooking that the fat and connective tissue start to dissolve and turn the cuts into finger-licking goodness. So fear not, young grasshopper. Keep the heat low and slow and you’ll have a darn hard time overcooking your cheap cuts. We’ve learned that beauty is only skin deep, especially when it comes to pork and that we shouldn’t fear cuts from questionable parts of the animals that look grizzly and contain copious amounts of fat and connective tissue. Rather, when cooking slow food, we should reach for something that has been doing a lot of work when the critter was alive and as such contains a lot of fat and connective tissue. Secret tip for unappetizing cuts #1: Add add cream! Lots of it! For my money, I know of no muscle on the pig that does more work than the subject of this post: the cheek musculature. After all, pigs are about the only animals I can think of that eat more than I do. This makes for a lot of chewing and a lot of work for the cheeks, which goes to reason that if we treat the cheeks right, they’ll be one of the most tender and tasteful cuts on the entire critter. Regardless of appearance and associations. And now, if we can only get past appearances and origins, and keep the rules above in mind, cooking pork cheeks is what we’ll do! So, we’ve got the basic cooking skills down and know how to pull flavor and tenderness out of our cheeks, but that’s no reason not to add a bit of flavor. And for my slow food pork cheek experience, the flavor was obvious: beer! My dad really enjoys a good, dark, alcohol heavy beer. Well, half of one since his accident anyway. And he really enjoys cooking with it as well. For that very reason, I very quickly decided on beer-braised pork cheeks in a rich, buttery cream sauce for our latest slow food adventure. Since we had about all the time in the world, I also decided to marinate the pork cheeks in a local porter-style beer with plenty of alcohol, chocolate malt and a healthy shot of licorice. I added a few umami-rich ingredients like soy sauce and Worcestershire sauce to the marinate along with a few herbs and spices, but overall, I decided to keep it relatively simple. I chose ingredients that would add intensity and depth to the flavors of the pork cheeks without in any way overpowering them. My intent was to enhance the deep, slightly sweet and succulent flavors of the cheeks without adding too many contrasting layers of flavors or spice. And I rather think it worked. If you want bolder flavors, you can certainly add more herbs or spices or give it an extra shot of flavorings. I suggest you hold back at first, though, as the flavors develop substantially during cooking. You can always add more near the end if you feel the dish needs it. It’s a lot harder to undo seasoning than it is to add more. 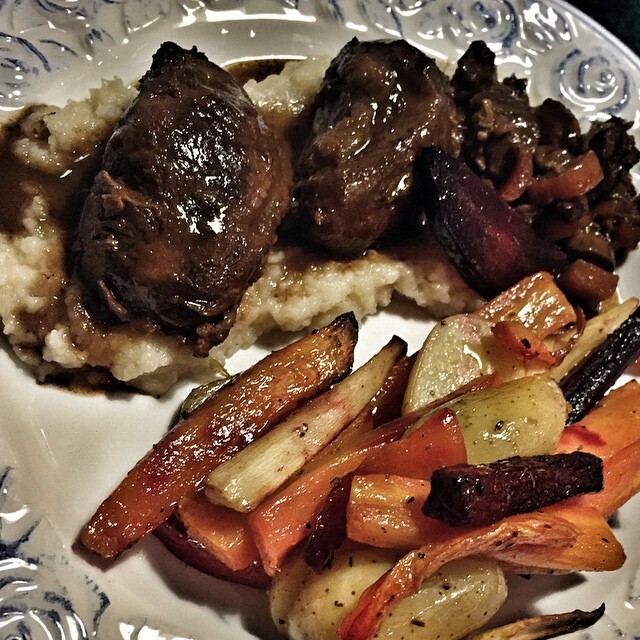 Beer-braised pork cheeks with bacon in cream sauce, what’s not to love? I marinated the pork cheeks for about four hours which really is more than enough with most cuts of meat (but that’s another post), then fried them golden brown and delicious in a combination of oil, butter and bacon fat before braising gently and carefully in some of the marinade and dousing them in cream sauce made on the side. And that kind of treatmeant, really, was all the pork cheeks needed to make a meal fit for kings. The details are below, enjoy! Careful on the heat: A friendly word of warning here, stolen from John Currence‘s amazing effort Pickles, Pigs and Whiskey: pork cheeks are incredibly delicate pieces of meat, so cook them carefully at a gentle simmer. Anything more and you run the risk of them literally falling apart. Cook them gently and they will maintain their shape, but still be unbelievably moist and tender when you cut into them. 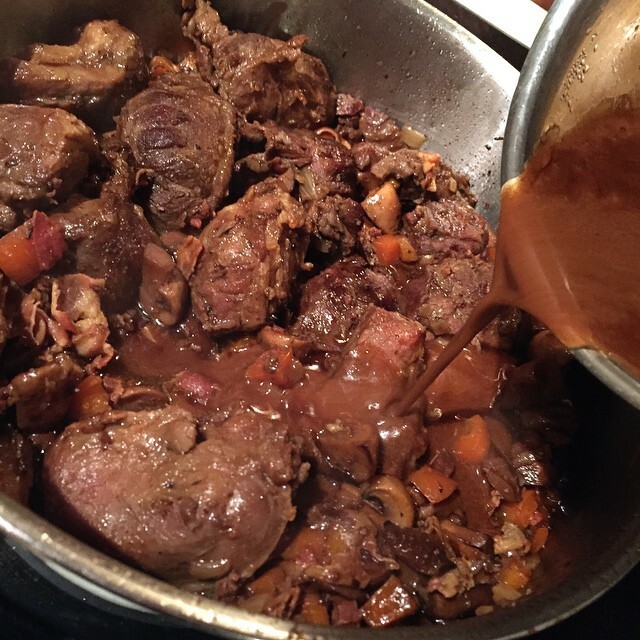 Pork cheeks marinated and braised in dark beer make for an absolute succulent and tender slow food winter meal. Grab your pork cheeks and sprinkle them evenly with salt, pepper and sugar, set aside for five minutes. Throw your pork cheeks in a heavy duty plastic bag or similar. Add hot sauce, Worcestershire sauce, soy and vinegar to the bag along with about 200 milliliters of the beer. Carefully place the bag and put it in the fridge to marinate for about four hours, turning once or twice. Thoughtlessly sip the remainder of the beer while meat marinates. Evacuate the pork cheeks from the fridge, remove from the marinade and pat them dry. Do NOT discard the marinade. 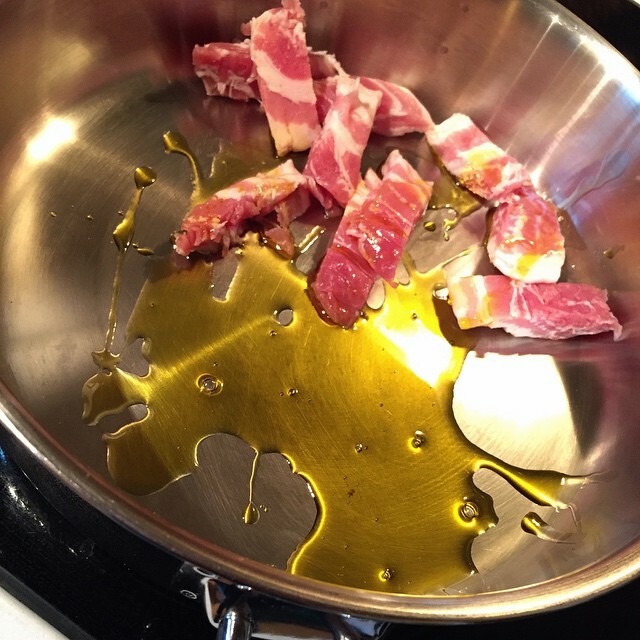 Put about a tablespoon of cooking oil and the bacon into a large, cold stainless steel sauté pan. Put pan over medium heat and cook until bacon is crispy and the fat has rendered out, about five minutes. Evacuate the bacon from the pan, raise heat to medium-high and add a knob of butter. 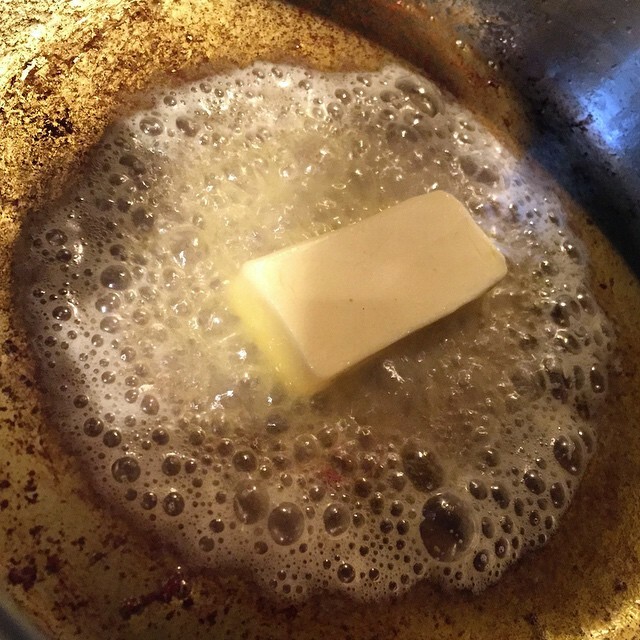 When butter has melted, put pork cheeks into the pan and brown for a few minutes on each side until golden brown. If you have more cheeks than fit the pan, do this in batches. 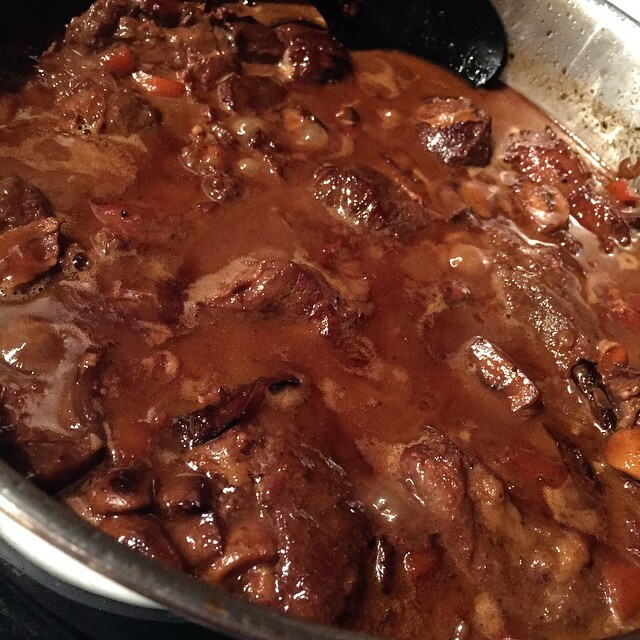 When all the pork cheeks have browned nicely, turn the heat back down to low and add the bacon to the pan along with the carrots, the onions and the garlic, bay leaves and star anise. Add enough reserved marinade to cover the bottom of the pan, cover the pan with a lid and braise the pork cheeks for at least two hours over low heat. Open another beer and enjoy it slowly while making the sauce and any sides you may desire. Pour the remainder of the marinade into a small sauce pan set over medium heat. Wait for the marinade to come to a low boil, then cook for about five minutes to boil out the alcohol. Add the heavy cream and the chicken stock, bring back to a low boil and reduce over medium-low heat for about 30-45 minutes. Don’t boil too aggressively. If sauce seems a little thin, dissolve a bit of corn starch in cold water, then stir into the sauce. It will thicken almost immediately. After about two hours, lift the lid off the pork cheeks and test them for doneness. A fork should slide in without any resistance. Carefully fish out the bay leaves and the star anise pod, then pour the cream sauce into the pan and allow to cook for a further five minutes for the flavors to properly mingle. Taste for seasoning (it probably doesn’t need any more salt!) and adjust. If the sauce is entirely too rich and creamy, try adding another splash of vinegar or two. When it comes to plating up braised pork cheeks, the sky is the limit. You could go all man with a decadent side of my ultimate mashed potatoes if you feel like you really need the extra weight and calories. My dad and his wife are on a bit of a low carb fad kind of thing, so I forfeited the mashed potatoes in favor of a simple celery root purée, a flavorful and vastly overlooked side dish option. To add a bit of textural change, crunch and sweetness, I threw in an extra side of roasted, mixed root vegetables (beet root, parsnip, carrots and a few potatoes to comply with my own high carb, high fat diet) as well as a few left-over caramelised mushrooms, I had lying around from the night before. 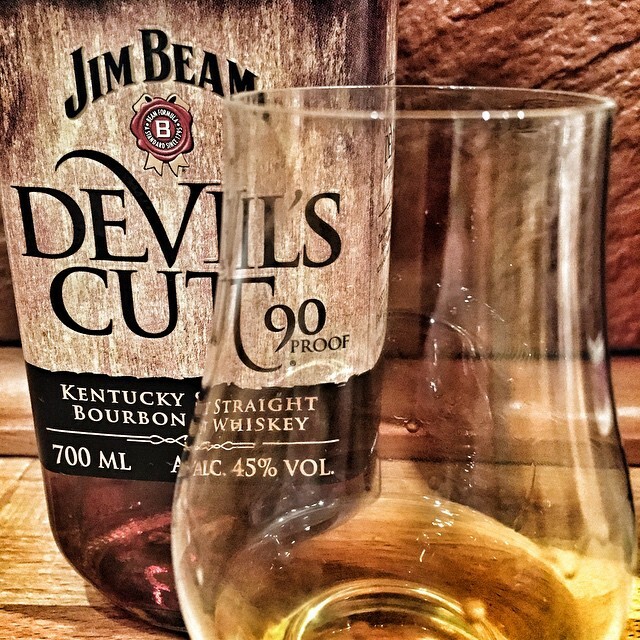 How’s this for a serving suggestion? The result was a rich, dense, slow food extravaganza bursting with warmth and flavors. It’s amazing, my dad remarked, how such supposedly simple dishes can pack so much flavor given the right preparation and the right amount of time. And I’d have to agree. The flavors and components here aren’t all that many or all that bold for that matter. Rather, they’re used in a manner to help accent and carry the flavors of the pork cheeks which, like it or not, are one of the most meaty, most flavorful cuts on the lovely critter that we call the pig. And there you are, my friends, another 4000+ words on a single subject. This time something so simple and overlooked as pork cheeks. You may be wondering, given my constant talk about how busy I am in my every day life, why I’d sacrifice so many words and so much time on the subject? The answer is simple, really. I inspire with this blog not to boost my own ego or showcase my skills. I strive to inspire you, the reader, to share my passion for cooking, for quality ingredients, proper preparations and new ideas. I want you to know that there are other cuts of pig out there than the 4-5 we usually eat and I want you to know that amazing things can be done with them. I want you to know this because we, as a race, seriously need to start considering how we treat the animals slaughtered for consumption and how we make the most of them once they have been slaughtered. We need to do this because, let’s be serious, our current meat production is not ethical and it’s not sustainable. It’s putting incredible strain on the environment, on the poor animals and on ourselves, the consumers. All because we’ve by and large become so wealthy and so spoiled that we can afford to be picky with what we eat. Over the last decades we’ve grown to love lean, tender cuts of meat and we’ve come up with production methods to get exactly what we want; quickly, cheaply and often without much regard what-so-ever for the well-being of the animals that give their lives for our sustenance and enjoyment. Through creative cross-breading and unnatural selection, we’ve created breeds that are not only leaner than nature intended, but also contain larger portions of the cuts we like and less of what we don’t like. We’ve invented growth hormones and other things to make our production animals grow faster, decreasing the need for food and care all while increasing profits. We’ve invented medicine to help take care of illness and we’ve discovered that if we administer said medicine or penicillin before the animals get sick, they shockingly run very little risk of ever becoming sick. Production has become so fast, so streamlined and so unnatural that we can now breed a host of animals at an alarming rate to satisfy our cravings for a few select cuts. Since the production process, generally speaking, has become dirt cheap, the less desirable cuts we can simply let go to waste or ship them away to less picky consumers in far away countries who will often pay handsomely for them, leaving us with more money to produce more tenderloins and pork chops. It’s a vicious circle that’s not only almost intolerably cruel to the animals, it’s also destroying the breeds, and helping us quite well in destroying our planet and destroying ourselves. Seriously. Maybe it’s time we started eating a little less meat, and in doing so, eating it a little more wisely. Maybe it’s time we actually started caring about where our meat came from, how it was produced, the well-being of the animals sentenced to die for our pleasure, which additives, medicines and poisons went into it. And while we’re doing that maybe it’s time we started eating those less favorable, poorly understood, slightly overlooked and quite frowned upon pieces of critter that are otherwise either destroyed or shipped half way around the world. Like the absolutely gorgeous and succulent cut that is the cheek muscle! 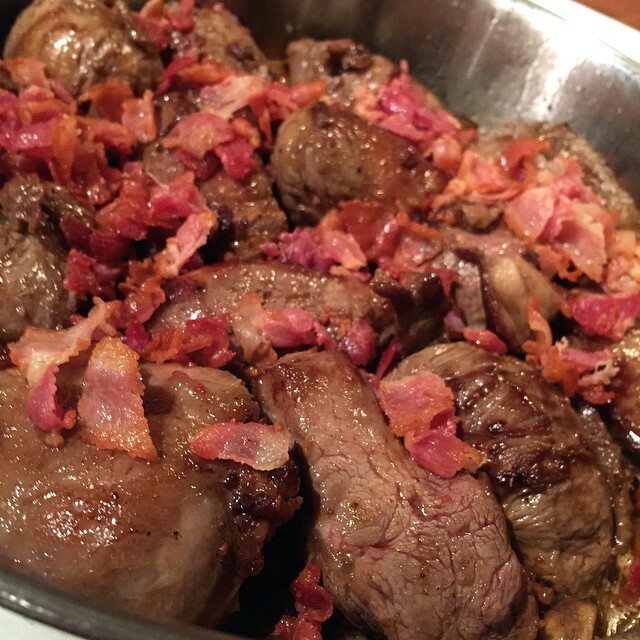 This entry was posted in Recipes and tagged bacon, comfort food, man food, pork, slow food.